It is a beautiful July morning under the warmth of the equatorial sun when I find myself following a group of happy and enthusiastic children along a foot path through the village, across a log that bridges a muddy creek to the edge of the rainforest. Tugging on my arm, Segundo stops me and points up into a nearby tree. Segundo, a young Maijuna boy around 11-12 years old has spotted a Black-fronted Nunbird and doesn’t want me to miss seeing it. Both of us focus in on the bird with our binoculars for a fantastic look. Quietly, with smiles and hand gestures we communicate our shared joy of discovery since neither of us speak a common language. Segundo is just one of around twenty-four Maijuna children, who for the first time in their lives are using binoculars for a close-up view of birds near their village. Our group is led by local birding expert, Percy Reyna and several educators from the United States who use the BirdSleuth curriculum developed by Cornell Lab of Ornithology. Together we spend a joyful hour learning to focus binoculars and chasing after birds. It is children just like Segundo that motivated us to create the Amazon Binocular Project. We want to inspire and support the next generation of Amazon birding guides. Our aim is to develop within these youngsters an interest and love for the rich rainforest biodiversity by giving them access to the tools that will help them better observe and enjoy nature. Segundo and his friends are in an especially exciting and unique position because they are being raised in one of the Maijuna villages responsible for creating the Maijuna-Kichwa Regional Conservation Area, a huge 977,600-acre wildlife preserve in northern Peru. These children will eventually inherit the responsibility of managing, protecting, and educating others about this global treasure. 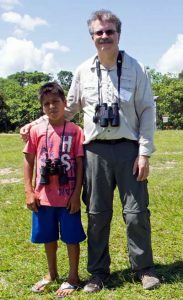 The Amazon Binocular Project grew from the inspiration of Lucio Pando, a gifted Amazon bird guide who loved to work with children. When Lucio unexpectedly passed away last fall we were determined to carry on his legacy of inspiring young minds in the Amazon. Percy Reyna and Cesar Sevillano, Lucio’s colleagues enthusiastically stepped up to work with the school children in remote Amazon villages. Both Percy and Cesar traveled to Cornell Lab of Ornithology in 2016 for training in the BirdSleuth program and are uniquely qualified to continue the work begun by Lucio. The Amazon Binocular Project webpage became live last November and we began to receive donations of new and used binoculars. During the school year my 7th and 8th grade students in Oregon helped clean, repair, and pack the binocular donations for transport to the Amazon. In April an exciting win-win opportunity developed when we learned Amanda Chang’s students in Chicago were planning a trip to the Amazon, but many could not afford their own binoculars. So, we shipped half of the binoculars to her students to transport, use, and then hand off to Percy and Cesar. The rest of the binoculars were shipped to Sarah Goodman’s students in North Carolina who volunteered to deliver them during their trip to the Amazon. Teacher participants in the Educator Academy in the Amazon Rainforest brought additional binoculars and a spotting scope. In all, a total of twenty-eight pairs of binoculars and one spotting scope completed the optics collection entrusted to the bird guides during the summer of 2017. We are excited about the binoculars we put into the hands of Amazon children during our first year and are grateful for the generosity and collaborative teamwork of so many people. We especially want to thank Celestron who helped us find some gently used binoculars to add to the 2017 collection and BirdsEye Nature Apps who helped spread the word about The Amazon Binocular Project. The author with a student. Although Percy and Cesar now have a traveling classroom set of binoculars to use with children, the need for more binoculars is still great. The teacher at the Maijuna village school expressed a strong desire to have binoculars become a permanent part of his bird watching curriculum. As Percy and Cesar spread enthusiasm for bird watching throughout Amazon village communities we expect demand for binoculars to increase among local educators. We are thrilled to support these teachers as they encourage young birders like Segundo. If you have new or used binoculars, spotting scope, tripod, lens caps, or straps to spare, please send them to the Amazon Binocular Project. See our webpage for details at http://amazonworkshops.com/amazon-binocular-project/.